“Nes gadol haya sham – A great miracle happened there!” We say it every year as we sing our traditional Chanukah songs or play dreidel over chocolate coins with our kids (or for higher stakes with our friends). We remember the struggle for religious freedom and the wondrous divine interventions that have added color, imagination and a spiritual connection to our historical narrative. This year, with Thanksgiving coinciding as it does, we add a level of family togetherness and a greater sense of gratitude to our light-filled ritual. Through The blessings, the songs, the games, the candles and the food, we try to connect to a far-away place in a far-away time. In recognition of the holiday, we deviate from our regular cycle of Haftarah reading, and we substitute a special reading for Shabbat Chanukah. Sixty years after the destruction of the First Temple in 586 BCE, the prophet Zechariah, having returned from the Babylonian exile, describes his vision of Joshua the High Priest being absolved of all sin and restored in robes and ornaments of the priesthood. His vision continues with a description of the seven-branched menorah of gold in a rebuilt and rededicated Temple. (Note: this is the 7-branched candelabra that stood outside the Jerusalem Temple’s Holy of Holies, not the chanukiah!) The Israelites had been slow to return to their homeland from Babylon, and slower to engage in the rebuilding effort. Perhaps this was Zechariah’s effort to inspire them to believe that the time was at hand. The prophet goes on to connect to the menorah the message that our faith in God will always lead us further than our individual or collective military or political accomplishments: “Not by might and not by power, but by God’s spirit.” Written long before the Maccabees fought their battles, Zechariah’s words bring comfort and hope to the disenfranchised. I have had the privilege of spending the last week in Israel. To be here the week leading to the holiday is a gift. 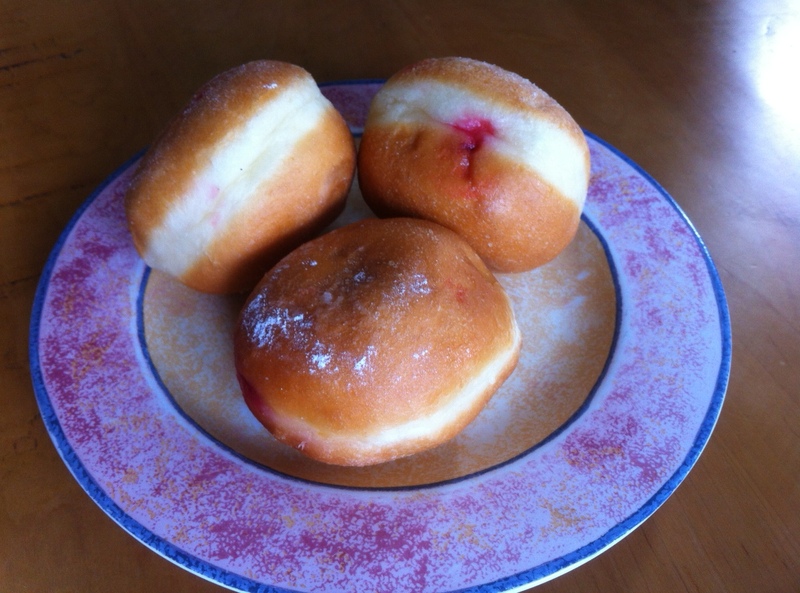 Sufganiyot (traditionally jelly-filled doughnuts, though increasingly more and more fancy-shmancy) can be found in every bakery. Families are preparing for school vacation. This holiday, more than any other, occupies a special place in the heart of the average secular Israeli. There is a greater sense of individual ownership of this holiday above the major festivals and even Purim. Its ritual is home-based, and there are few requirements that cause the Iess observant to feel that they can’t observe and appreciate the holiday to its fullest. The Maccabee spirit is one with which the many Israelis who have served in the IDF can identify. The victory of the few over the many characterizes a large part of Modern Israel’s narrative. As each person kindles his or her own menorah (now you can insert chanukiah! ), the average Jew can fill the role of Joshua the High Priest, celebrating national sovereignty and exercising personal sovereignty, affirming a spiritual connection to God, a shared past and a common destiny. As Jews living outside of Israel, we carry this light beyond the physical boundaries of the holy land; we are charged with delivering it to the rest of the world. In the moment that we light our chanukiyot, the words of the prophet Zechariah remind us that we are all builders of holy places in our lives. If we dedicate ourselves to the lighting of the lamps in the spirit of God, we can indeed achieve that which all the military might and political power cannot. Each of us is the high priest, each of us represents the menorah, and each of us can raise up lights of peace, of hope and of the divine in ourselves and in others. What a wonderful post by Rabbi Scheff! Please join us on Tuesday night, December 3 at 6:30 pm as we light our personal chanukiyot together as a community in the Simcha Room of the OJC. Light supper, candles and song for everyone!